I spent some time this past weekend at the National World War II Memorial in Washington, D.C. This is a new monument in the capital, and I had been wanting to see it for some time. I’m glad I finally got an opportunity to visit, but I was disappointed with the memorial itself. First, the good news. The monument is big, though not enormous, and I think it does not ruin the views between the Washington Monument and Lincoln Memorial, as some suggested it would. It occupies the space immediately east of the Reflecting Pool. Because the memorial is depressed, it does not much affect the sight lines between the older structures. The water from the Reflecting Pool cascades into the new monument (or seems to, at any rate), and this helps to integrate the new construction into preëxisting elements of the landscape. There are other positive things to say. The workmanship of the monument seems excellent. There is a lovely flagpole, fine bronze (I assume) bas-reliefs, and nicely detailed drain covers. The stonework is likewise impressive. The central pool and fountains are executed well enough, although they suggest a large municipal swimming pool more than a ceremonial structure dedicated to the central political event of the twentieth century. The fountains at either end of the pool are more imaginative and successful. They are framed in stone incised with names of major World War II battles. Here ends the good news; now for the bad. All the problems with the National World War II Memorial seem to be large-scale conceptional ones. At the north and south ends of the structure are large pavilions labeled, respectively, “Atlantic” and “Pacific.” This may not be the ideal way to classify events of the war, but the intention is clear. Obviously, El Alamein, Anzio, and Normandy were part of the “Atlantic” campaign (though not to be confused with the Battle of the Atlantic), and Pearl Harbor, Midway, and Iwo Jima were part of the “Pacific” campaign. I don’t think the Atlantic/Pacific distinction was a contemporary one made by the War Department—the war in Europe took place in the “European Theatre,” for example—but Americans no doubt thought of their boys as going to fight across the Atlantic or Pacific. This suggests, however, that the central plaza of the monument should perhaps be stone, with pools (“oceans”) on either side. Or maybe not. More perplexing are the many pillars that flank the Atlantic and Pacific pavilions. Architecturally, these are completely unsurprising. What they represent, however, is odd. Each carries a wreath and the name of a state or territory. Why? Did not the Civil War firmly establish the United States as an indivisible entity, rather than a collection of sovereign territories? And why should, say, Kansas, be assigned arbitrarily to either “Atlantic” or “Pacific”? Did not Kansans cross both oceans to fight for their country? The pillars are completely generic; they could be used in the same way to memorialize any war fought by the U.S. It would have made more sense for the pillars to represent something more particular to World War II, such as individual battles. Perhaps there were not an appropriate number of battles fought, or the battles were too asymmetrically distributed to serve the required architectural need. On the wall to the west of the pool is the so-called Field of Stars, a large expanse of three-dimensional gold stars. An inscription “explains” the stars as follows: “HERE WE MARK THE PRICE OF FREEDOM.” Apparently, the 4,000 stars are intended to represent the 400,000 American casualties. The Field of Stars seems rather disconnected to the rest of the monument. It is an oblique reference to the unpleasantries of war, incipidly and self-consciously echoing the infinitely more affecting black walls of names of the Vietnam Memorial. This passionless allusion to horrors of war is consistent with the spirit of the design for the pavilions. 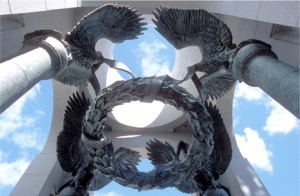 Within each one, above a floor design celebrating victory on all fronts, is a large bronze baldachino (canopy-like sculpture) of four eagles supporting a large, horizontal wreath. Admittedly, we won unconditional victories in both the east and west—with significant help from allies unnamed on this monument—but I think that the scale and spirit of the National World War II Memorial would have made George Washington, and probably even Douglas MacArthur, uncomfortable. The monument makes victory look too easy, too inevitable. Only in the relatively obscure bas-relief panels is any real difficulty on our part suggested. Had Germany been the victor in World War II, one can imagine Albert Speer designing a monument much like this one. Our monument is very much in the triumphalist style favored by Hitler’s architect. Of course, Speer would have added swastikas to all the wreaths.